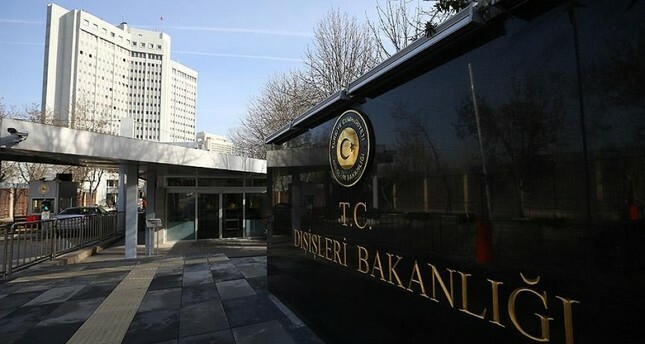 Turkey's Foreign Ministry has called on China to respect fundamental human rights of Uyghur Turks and shut down concentration camps on Saturday. "China's systematic assimilation policy towards Uyghur Turks is a great embarrassment for humanity," the ministry said in a statement. "It is no longer a secret that more than one million Uyghur Turks, exposed to arbitrary arrests, are subjected to torture and political brainwashing in concentration centers and prisons," said Hami Aksoy, spokesman of the ministry. "Uyghurs, who are not detained in the camps, are also under great pressure. Our Uyghur-origin citizens living abroad cannot hear from their relatives living in the region," he added. "We also call on the international community and UN Secretary-General to take effective steps to end the human tragedy in Xinjiang Region," he added. Aksoy also mentioned about Saturday's demise of Uyghur poet and musician Abdurehim Heyit. "In such an environment, we've learned with great sorrow that dignified poet Abdurehim Heyit, who was sentenced to eight years in prison for his composition, died in the second year of his imprisonment," he said. "This tragic incident has further strengthened the Turkish public's reaction to the serious human rights violations in Xinjiang Region," Aksoy said. China's Xinjiang region is home to around 10 million Uyghurs. The Turkic Muslim group, which makes up around 45 percent of Xinjiang's population, has long accused China's authorities of cultural, religious and economic discrimination. Up to 1 million people, or about 7 percent of the Muslim population in Xinjiang, have been incarcerated in an expanding network of "political re-education" camps, according to U.S. officials and UN experts. In its last report released on last September, Human Rights Watch blamed the Chinese government for a "systematic campaign of human rights violations" against Uyghur Muslims in northwestern Xinjiang, an autonomous region in the country. According to a 117-page report, the Chinese government conducted "mass arbitrary detention, torture and mistreatment" of Uyghur Turks in the region. Abdurrehim Heyit, an Uyghur poet and a musician renowned with his songs narrating Uyghur history and culture, was born in Kashgar city of Xinjiang Uyghur Autonomous Region, in 1964. Heyit, who studied at a Fine Arts School in Kashgar, became a world-renowned poet in a short time with his songs that he sang with his dutar, a type of two-stringed instrument with a long neck that is found in Iran and throughout Central Asia. Heyit had been detained in Urumqi, in 2017 without being charged with any crime and sentenced to 8 years in prison. He was in the prison when he was died.